Bert points to various spots along the cliff where waterfalls had formed all around them that fateful morning. I struggle to keep the camera pointed at him. I’ve read about and heard the story a dozen times, most recently during the seven-hour car ride to the Texas desert five days ago, but I realize I haven’t truly grasped the enormity of what happened. 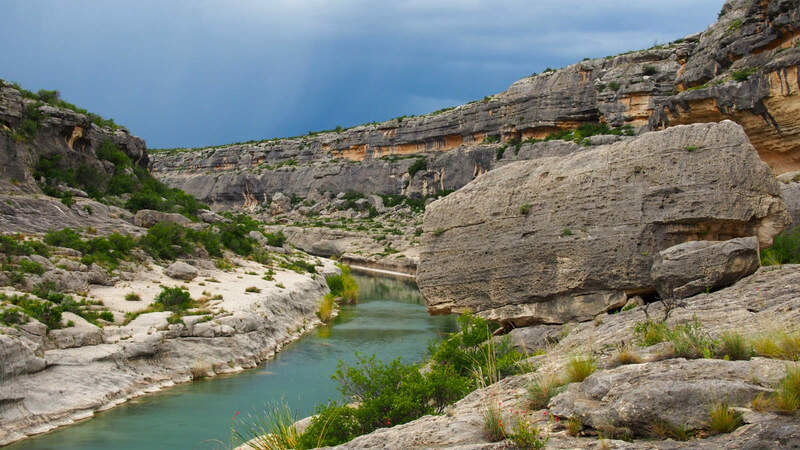 Now, looking up at the sheer 200-foot cliff face that forms the Lower Pecos River’s eastern bank, the terrifying reality of what my two companions had experienced comes to life. I snap out of my thoughts when I hear Daniel ask through the satellite phone: “When is the system going to hit? 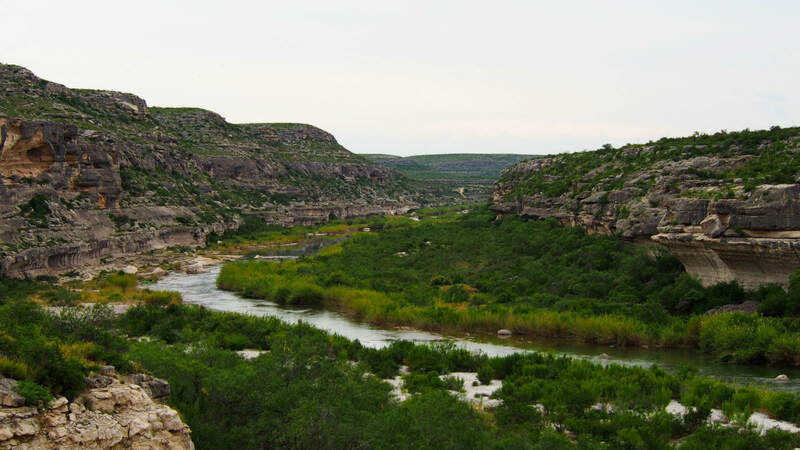 The Pecos River cuts through the rocky desert in southwest Texas before dumping into the Rio Grande along Mexico’s border. The landscape is vast. No matter how far I hike or how high I climb, I can’t capture the entire view with my lens. The vegetation is aggressive; most plants in the region can stick, stab or cut you. 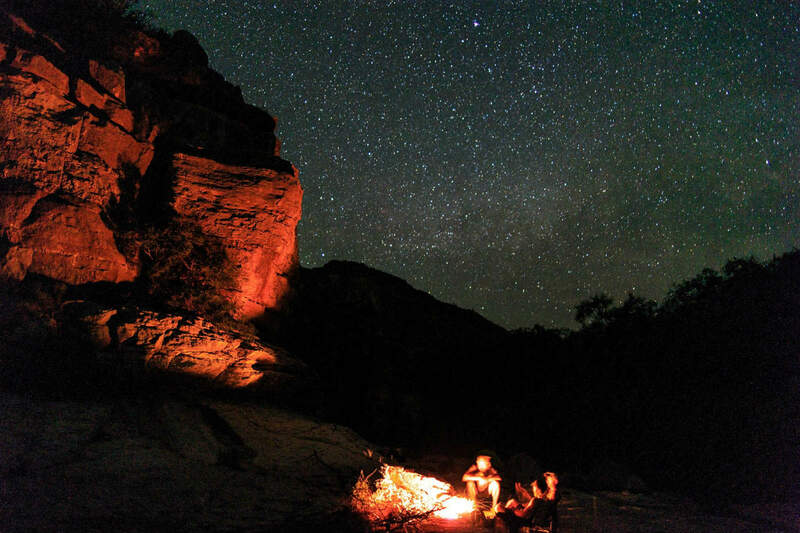 Scorpions, rattlesnakes, mountain lions, wild mustangs and aoudads, an unusual blend of a goat and an antelope, also call this place home. The aoudads were imported from North Africa to high-fenced, exotic hunting ranches, but many have escaped and adapted to the arid landscape. Our presence doesn’t disturb the wildlife, though, or perhaps they choose to stay close to the river despite our presence. 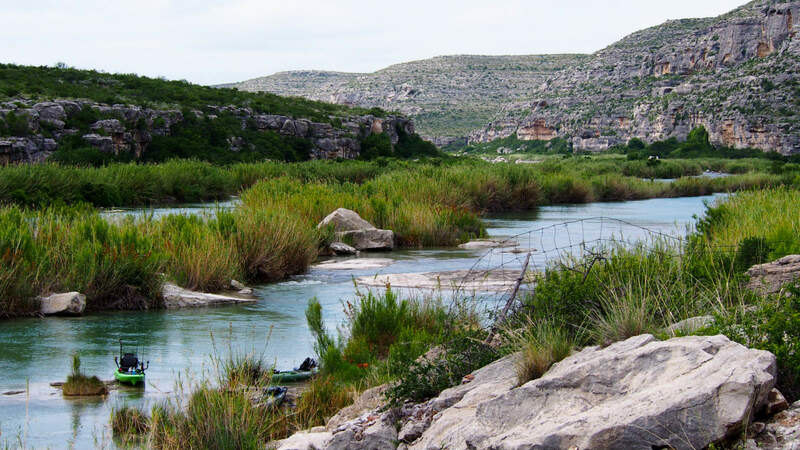 The Pecos is the sole source of water for many miles, so all nearby life clings to the waterway like a baby opossum grips its mother. The river is the lifeblood of this region, an oasis that carves its way through the middle of nowhere. 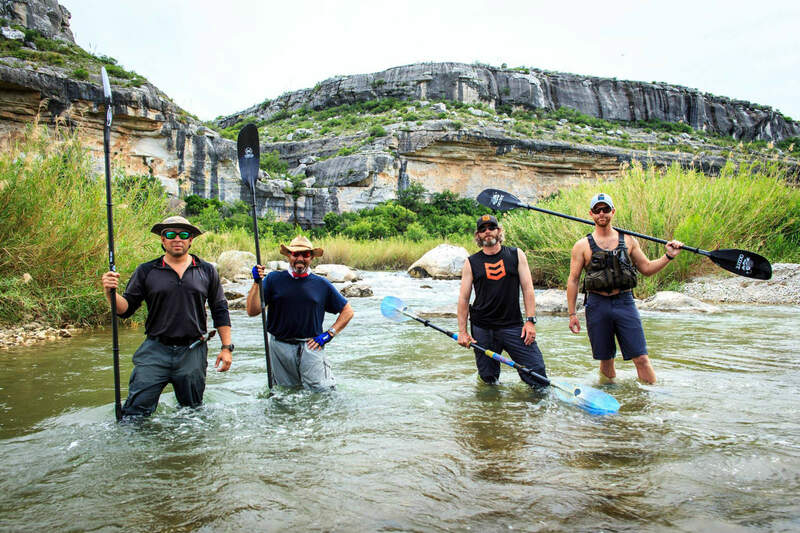 Two years prior to this trip, Bert and Dan Rodriguez, father and son, attempted to paddle this stretch of river. What began as a smooth float, took a disastrous turn on their third night. The skies opened and thunderstorms dumped rain throughout the night. Unable to sleep due to the noise and concerns of flooding, their group stayed awake to keep an eye on the river level. Despite the rainfall, the level remained unchanged—until daybreak. Shortly after dawn, Bert recalls water beginning to trickle over the cliff behind them. Within minutes, this trickle grew into a small waterfall. Within an hour, waterfalls were forming all around them, the muddy water cascading into the river basin like the edge of an infinity pool. The river began to rise. The group stashed their gear and headed for high ground. Their original egress route was now a torrent, and they were forced to locate a different escape route. A steep Jeep trail half-a-mile away served as their exit point, saving their lives. The river rose 31 feet in an hour. Local meteorologists categorized the flood as a 500-year occurrence and named it the Langtry Flood of 2014. Bert, Dan and the rest of their group lost over $20,000 worth of gear, including their kayaks and most of their camera equipment. A group not far downriver lost four pickup trucks. While the loss of material possessions was devastating, Bert and Dan were grateful to have escaped with their lives. Now, two years later, they’ve returned to the Pecos to finish what they started, and they’ve asked me to document the trip. Our expedition begins near Pandale, Texas, at Pandale Crossing, and our journey will take us down 60 river-miles to the Pecos High Bridge. Built in 1892, the Pecos High Bridge was the tallest railroad bridge of its time in North America. At first, the river is sluggish and murky green, but it gradually quickens and clears as we encounter frequent stretches of Class II and III rapids. With my focus on exploring this beautifully hostile river basin, the fishing is an afterthought, but I still make a quick cast at every visible boulder in the river. The fishing is easy. 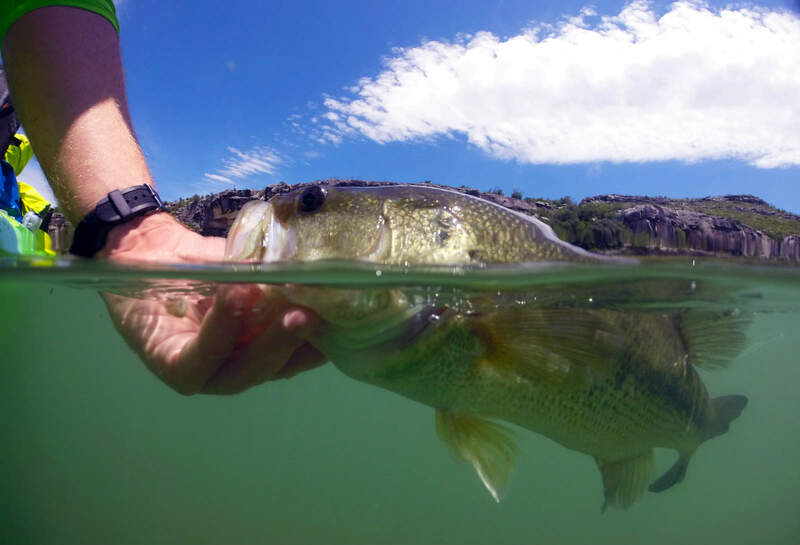 These fish don’t see many lures, and they can’t resist a free meal. 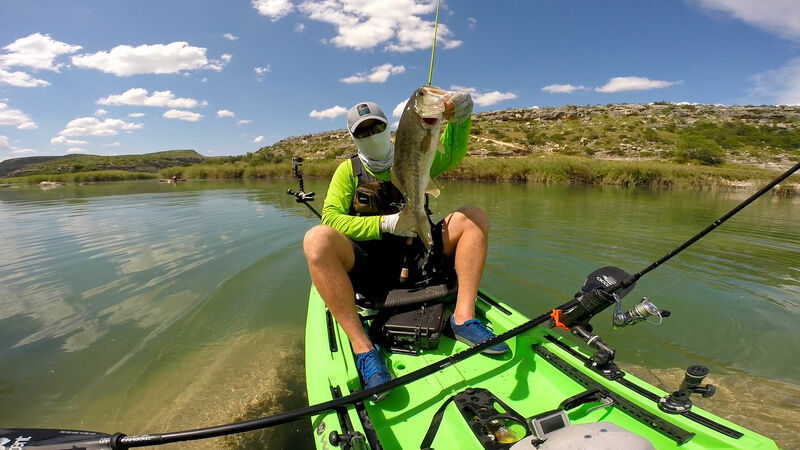 Every boulder seems to hold a largemouth bass, and my swimbait is irresistible to these ambush predators. I’m not fishing a lot, but I’m catching a lot of fish. As we paddle between the cliffs sandwiching our route, I think about the people who first called this place home thousands of years ago. I think about crossing this land without modern shoes. I consider sleeping on the rocky ground without a tent between the scorpions and me. The same scorpions we’re dumping out of our shoes each morning. I remember the mountain lion we encountered on day three, and how scared I was that night even though Dan had a firearm. It seems like every living thing in this basin is out to get us. There’s no cell service. The Langtry Flood took much from Dan and Bert, but they were given experience and wisdom in return. On this trip, Dan uses a satellite phone to call a buddy for a weather forecast each night. So far, the weather has been perfect, the fishing has been productive, and nobody has flipped in the rapids. Spirits are high. 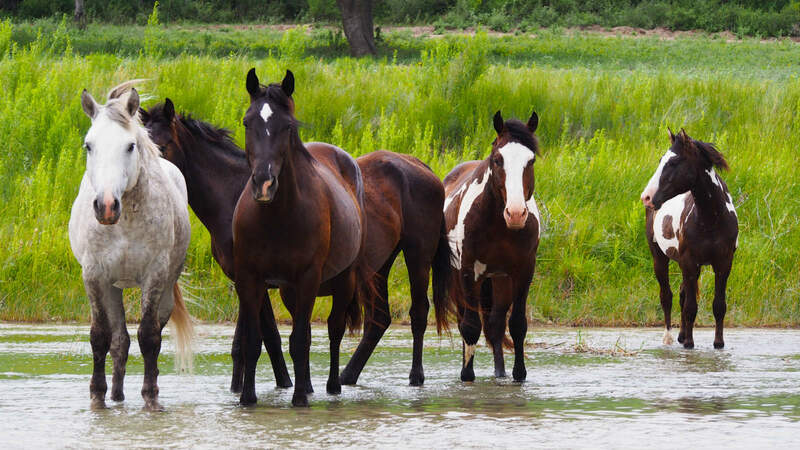 As we approach our camp on day four, we spot something I’ve been hoping we’d encounter on this trip: a group of wild mustangs. They seem as unimpressed with us as the rest of the wildlife in the region. We make camp across the river from the herd. Water trickles down from the rocks behind our camp and we decide to follow it up the rocky slope to find its source. Our hike ends at a large, moss-covered boulder jutting out from the cliff, crystal clear spring water dripping from its belly like a shower head. As I drink directly from the limestone-filtered spring, I can’t remember spending a night at a more magical campsite. Morning breaks and the horses are still nearby, already grazing in the rising dawn. 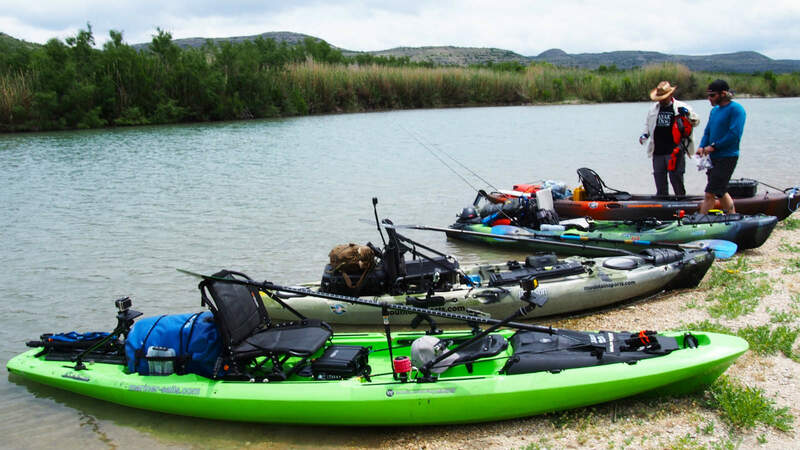 The day follows our typical routine: dehydrated breakfast and instant coffee, camp breakdown, lots of rapids and 30-mph headwinds, a loud “Fish on!” from someone in the group every half hour or so, and ultimately the search for a suitable campsite. We round another bend and Bert and Dan stop paddling. They’re staring at something. “This is it,” Bert whispers. “This is where it happened.” We paddle over to the bank, and I follow Bert and his son toward an overhang in the cliff face. “Don’t record this just yet, we’ll redo the walk-through later so you can film it,” he says. I ignore him, but the request seems to put him at ease. “We jammed our gear as far as we could into this crevice, hoping it might stay put if the water rose this high,” he explains, pointing to a crack in the overhang. “None of us actually believed it would, though.” The river did rise that high (and twenty feet above it), and their gear didn’t stay put. He points out the original egress route they had to abandon, and for the first time I can imagine the waterfall that covered the now bone-dry limestone. We walk along the rocky terrain until we come to the Jeep trail they had to climb, the discovery of which certainly saved their lives. I use the word “climb” because I’ve never seen a Jeep that could drive up this trail; it’s steep and riddled with boulders and potholes. “Luckily this small ditch ran alongside the trail. It funneled most of the water off the trail itself. We were only trudging through six inches of water at this point,” Bert explains as I stumble up the trail. We reach the top and I grasp the true nature of this area. The canyon narrows at this point, thus amplifying the river’s swift rise two years ago. 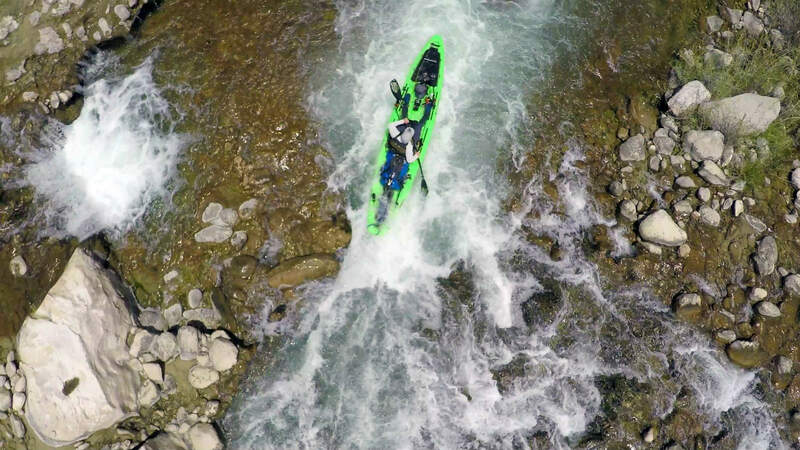 “I remember arguing about whether we should abandon the kayaks and climb, or get in the kayaks and try to paddle out. We decided to climb,” Bert recalls. He describes how they tied their boats to boulders, hoping they might withstand the current as the river rose. They didn’t. At the top of the cliff, Dan contacted the Coast Guard by satellite phone, and the group was rescued by helicopter hours later. They watched as the shallow, pristine waterway transformed into a muddy tsunamic flood. We weren’t meant to repeat the past. We’ve wasted most of the afternoon light and the sun is sprinting for the horizon. We have to get moving, now. We scamper down the trail as quickly as possible (not quickly at all) and launch the kayaks. We head downriver to the next suitable campsite. We’ve garnered permission from the landowner to explore his ranch above the cliff, which will provide a safe campsite far above the river. We hear an ominous rumble as the sky darkens. We’re running out of time. In my obsession for getting the shot, I lag behind the group fumbling with my cameras, trying to capture different angles of our race toward safety. When I look up, I can no longer see the group. To articulate what happens next is difficult. The hairs on my arms and neck begin to stand up; it’s a familiar sensation turned foreign. Before my brain can process what’s happening, I lose my vision to a blast of white. The loudest sound I’ve ever heard rings my ears and I see nothing. I can feel the sound through my entire body. The ringing, the light and the sensation cloud my thoughts. In what feels like an hour later, my vision begins to clear and I panic. “I just got struck by lightning!” I yell to no one. After a visual inspection of my kayak and my body, I realize I haven’t been struck. Not directly, at least. 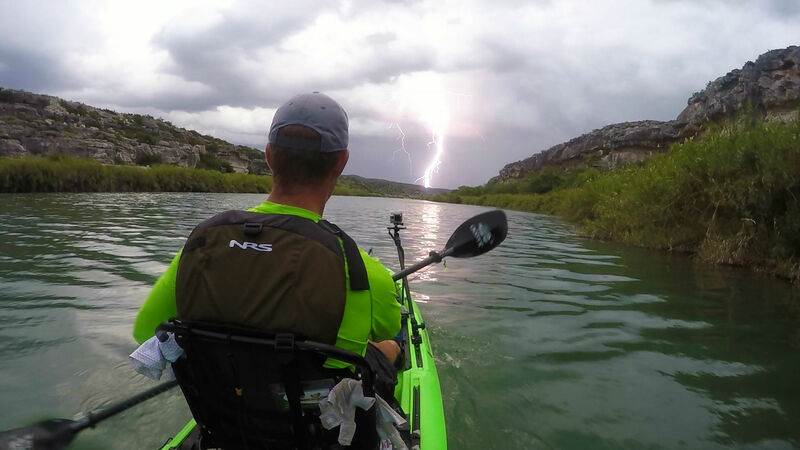 But it was way too close for comfort, and suddenly, I’m trying to break the kayak speed record. I round a bend and relief overcomes me; I can see my companions’ kayaks on the bank a few hundred yards ahead. They’ve already begun hiking up to safety. I catch the eddy, drag my kayak as far as I can, secure it to a boulder with my bow rope and throw my Bill’s Bag on my back. I resemble a linebacker at the combine as I run up another steep trail hauling 75 pounds of gear. As we set up camp, the rain begins to fall. Lightning strikes in all directions every three to five seconds, so often that it resembles daylight despite it being ten p.m. None of us will be sleeping much tonight. This time, the river decides not to steal Dan and Bert’s gear. When we wake, the rain has stopped, and our kayaks are where we left them. Potential disasters don’t threaten us for the remainder of our trip, but the Pecos continues to deliver once-in-a-lifetime experiences. Following the storm, we explore Lewis Canyon and find an acre of petroglyphs. 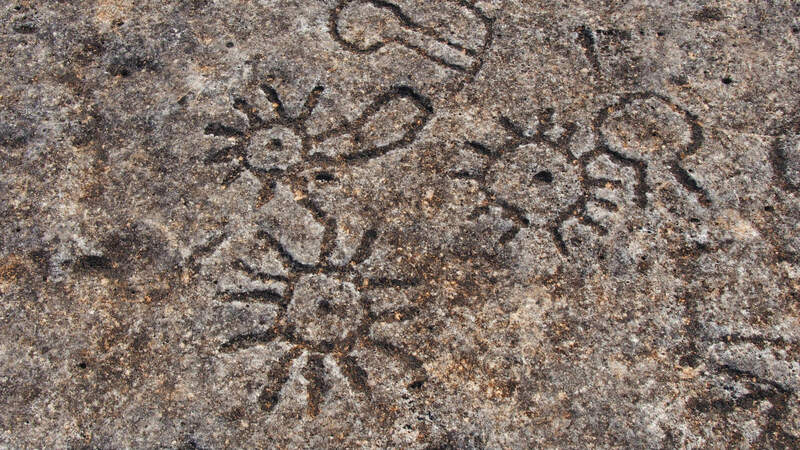 The ancient carvings depict humans, primitive weapons, animals and a downright immature number of phallic symbols. We find ancient scrapers and other tools in the same area, bringing to life how the early inhabitants survived in this inhospitable landscape. 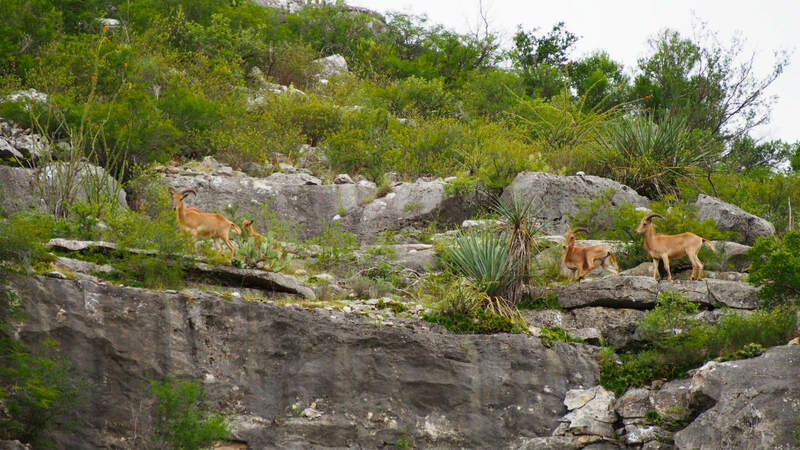 The next day, we observe a family of wild aoudads hopping along the rocks on the edge of a 300-foot cliff above Painted Canyon. Even the kids bounce effortlessly from rock to rock, unconcerned by the certain death awaiting them if they miss a step. For seven days and nights, I’ve been living on dehydrated Italian dishes and egg soup, beef jerky and melted protein bars. Cuts, scrapes, and bruises cover most of my body. My skin has been protected by NRS silkweight for most of the trip, but the stints of shirtless paddling in an attempt to beat the heat have left me sunburned anyway. Yet on the eighth morning, with nothing but an easy half day’s paddle between us and our takeout, I’m overcome with a sense of dread. My complaints of discomfort throughout the week seem misplaced as the trip meanders to an end. While we have done everything in our power not to leave a mark on this pristine and secluded oasis, this river has certainly left its mark on us. I take her attempt at killing me as a compliment, like a middle-school girl with a crush, and I long for one more day in her company. Albert Einstein said, “Look deep into nature, and you will understand everything better.” I realize now that he wasn’t just referring to scientific principles. The eight days I spent on that river taught me more about myself, my limits and what’s truly important in life than all the days I’ve wasted in a cubicle or watching TV. 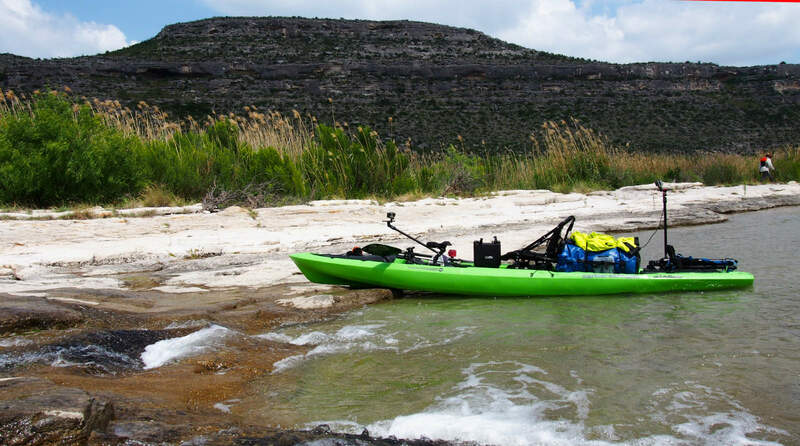 Editor’s Note: You can read Bert and Dan’s account of their return to the Pecos River on their blog: Lone Star Chronicles.